How does the scope for policy loosening affect the risk of deflation? Inflation is currently very low in the UK (indeed briefly dipping into negative territory in April), naturally raising speculation about whether we will experience persistent deflation in coming years. This post illustrates that the probability of deflation is raised further, and the likely duration of any deflation increased, if one thinks that there are limits on how far the Monetary Policy Committee (MPC) could loosen policy in the face of new shocks. We also explore how the current situation differs from other episodes since the crisis when the risk of deflation has been similarly elevated. While the MPC’s expectation (as shown in the May 2015 Inflation Report forecasts) is that there will be no quarterly deflation, and that inflation will return to within 1pp of the target by 2016 Q1, there is a risk that inflation stays low for longer. Ordinarily, faced with persistent undershoots of the inflation target – and even deflation – one might expect monetary policy to loosen to stimulate the economy and return inflation to target. 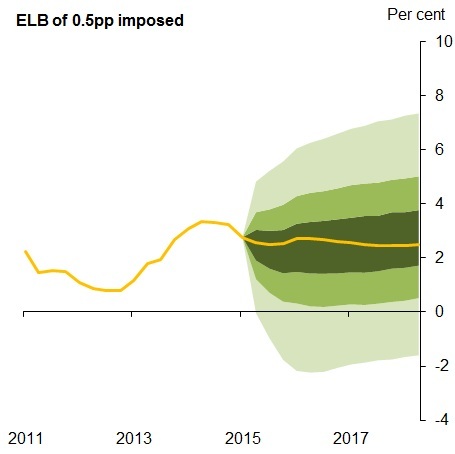 But with Bank Rate at 0.5%, it’s probably close to its “effective lower bound” (ELB), below which further cuts are either infeasible or undesirable. Moreover, Miles and Schanz (2014) suggest that quantitative easing (QE) may be less effective now than at the height of the crisis. Although the MPC’s view, as outlined in the May 2015 open letter to the Chancellor, is that in the face of more persistently negative inflation, they would have sufficient tools to loosen policy further to bring inflation back to target over an appropriate horizon, here we ask: how would the risk of deflation be affected, if in fact the MPC were constrained by the ELB? To answer this question, we have produced two sets of simulations using the Bank’s COMPASS forecasting model. For one set, the ELB binds and the MPC cannot lower Bank Rate below 0.5%. In the other, there is no limit on how much stimulus the MPC can provide. 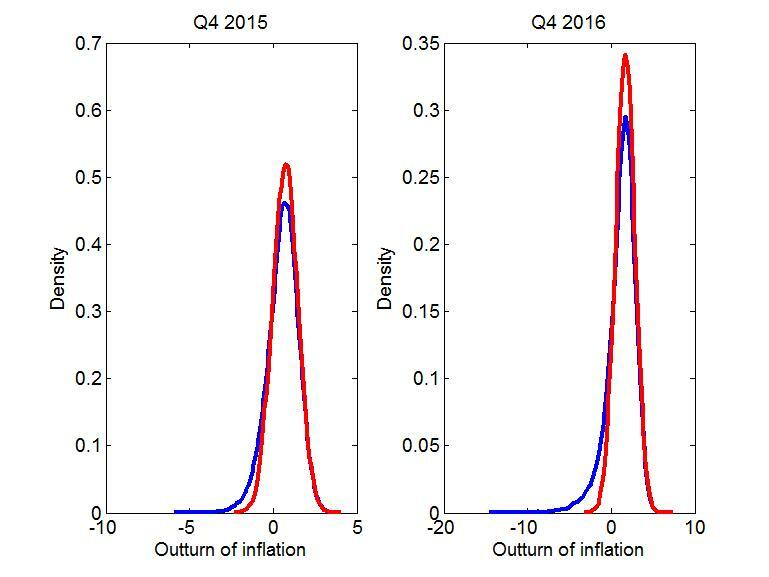 Our simulations show that, given the low level of inflation in the early part of the May 2015 Inflation Report modal forecast, there is a raised risk of deflation, even if policy is unconstrained. If we also assume little scope for further loosening, the probability of negative inflation increases, as does the average length of the deflationary episode. Our analysis reveals that this is by no means the only time since the financial crisis when the risk of deflation has been as elevated. But other episodes, such as the risk around forecasts made in 2012 and 2013, stemmed from an extremely flat yield curve. So how high the risk of deflation was at that time depends how far you actually believe that the ELB was a constraint. We begin with fan charts which illustrate the balance of risks to GDP and inflation under our alternative assumptions about the scope for monetary loosening, centred on the May Inflation Report forecasts. We produced these using stochastic simulations of COMPASS, adopting the approach of Holden and Paetz (2012) to impose the ELB in the set of simulations where the MPC are constrained. Our approach is very similar to that of Coenen and Warne (2014), who explored the balance of risks to inflation in the euro area. Note that our fan charts are not the same as the MPC’s. First, monetary policy evolves according to COMPASS’s policy rule (absent the ELB), rather than being conditioned on an exogenous path for monetary policy (usually the market path). And second, the MPC fan charts are produced judgementally, rather than with stochastic simulations. Comparing Chart 1 to 2 and Chart 3 to 4, shows that a lower bound on interest rates generates a skew in the distribution of outturns (most notably for inflation) and increases the probability of deflation. You can also see this from Chart 5, by comparing the broadly symmetric distribution of possible inflation outturns for Q4 2015 when no ELB is imposed (in red) to the skewed distribution where there is a binding ELB of 0.5% on Bank Rate (in blue). Chart 6 shows the same for Q4 2016. In practice, they are likely to be a lower bound on the true skews, as our simulations assume perfect foresight, i.e. agents’ expectations do not take into account the lower mean of the distribution resulting from the ZLB. The coloured swathes span 90 percent of possible outturns. Yellow lines give the modal path from the May 2015 Inflation Report. So what are the chances of deflation? Assuming no limit on the MPC’s ability to loosen in the face of shocks (Chart 1), the probability of deflation in Q4 2015 is around 17%, but that rises to a little under 25% if the ELB is a binding constraint. The equivalent probabilities for Q4 2016 are 8% and 20%. This illustrates that the effect of a binding ELB tends to be greatest further out, when effects of holding policy tighter than would otherwise be the case have had time to build. As well as affecting the likelihood of deflation, a binding ELB raises the size of the deflation (shown by the very negative bottom of the swathe in Chart 2) and the average duration (2.4 quarters versus 1.4 quarters). The assumptions we take above are extreme – either the MPC can loosen policy as much as they need, or not at all. The reality must sit somewhere in between. In a recent speech, Andy Haldane presented charts based on the same approach which showed that taking the lower bound to be 0%, rather than 0.5%, almost eliminated the negative skews in the inflation distribution. Those charts were based on the February 2015 Inflation Report forecasts, but it’s also true for the MPC’s latest forecasts. So you don’t need to believe that there’s a great deal of additional scope for loosening to mitigate the main downside risks. For example, the MPC’s statement in the May 2015 open letter to the Chancellor that it would be possible to cut interest rates to a level closer to zero might be sufficient, even absent unconventional monetary policy. To get a sense of how this higher risk of deflation compares to the past, we repeated our analysis for all Inflation Report forecasts since 2007. Chart 7 summarises the probability of deflation when we imposed an ELB of 50bp and Chart 8 where there is no lower bound. 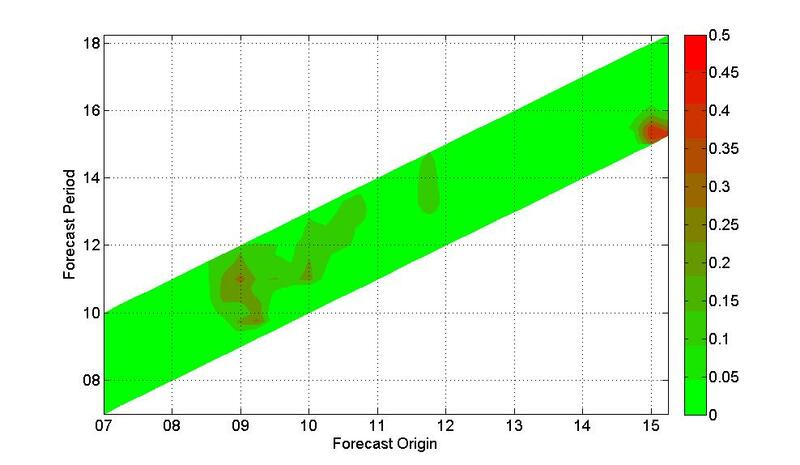 The horizontal axis gives the origin of each forecast, and the vertical axis the quarter being forecasted. Since the MPC produces forecasts spanning three years, the width of the band is constant, but each quarter, the first quarter of the forecast rolls on one (hence the upward slope). So reading vertically up the chart shows you the probability of deflation at different horizons, based on a forecast produced at the date on the x axis. Reading horizontally tells you how the probability of deflation in a particular quarter evolved over successive forecasts. 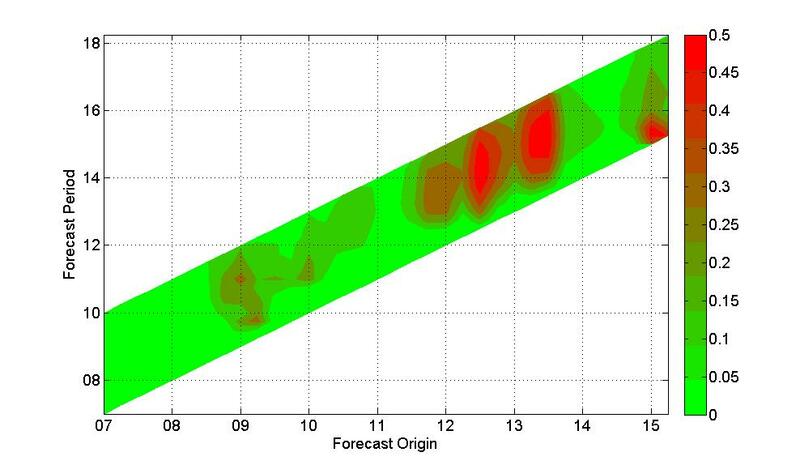 Green corresponds to a low probability, and red a higher likelihood of deflation. This is by no means the only episode of heightened deflationary risks since the crisis. What is special about now, is that the deflationary risk is more front-loaded in the forecast. The risk of deflation associated with forecasts published in 2012-3 was also very high, despite inflation being above target. That’s because the yield curve at that time was very close to 0.5% for the entire forecast horizon, and so given an ELB of 0.5%, there would have been very little scope for further loosening in the face of new shocks. You can see how important this assumption is by comparing Chart 8 to Chart 7 where the deflation risk essentially disappears when we assume that the policymaker has infinite scope for loosening. Right now, whether we think there is room for loosening our policy stance is largely irrelevant for the likelihood of negative inflation in the next few quarters. That’s because the MPC’s central case for inflation is very low to begin with, so small shocks could make it happen. However if the MPC were constrained, it would increase the likely persistence. These observations suggest that we can distinguish between two sources of heightened deflationary risk. First, when the most likely path for inflation is low, the likelihood of future shocks that push us into deflationary territory is automatically higher. The scope for easing doesn’t really affect that chance in the near term, but would increase the duration. At other points since the crisis, a high deflation risk stemmed from the assumption that the policymaker was constrained by the ELB and so whether you think the MPC did have scope for loosening is key. Unsurprisingly, given how low inflation is at present, the chance that the UK will see negative rates of inflation in the next few quarters is as high as it has been at any point since the financial crisis. But an additional factor which could contribute is if one assumed a lack of space for additional monetary loosening by the MPC. This would raise the likelihood of deflation, particularly at longer horizons, e.g. the probability for deflation in 2016Q4 rises from 8% to around 20% if the MPC is constrained. It could also mean that any deflation is larger and more persistent, e.g. on average 2.4 quarters rather than 1.4. Authors: Alex Haberis works in the Bank’s Monetary Assessment and Strategy Division, Riccardo M Masolo & Kate Reinold work in the Bank’s Conjunctural Assessments and Projections Division.